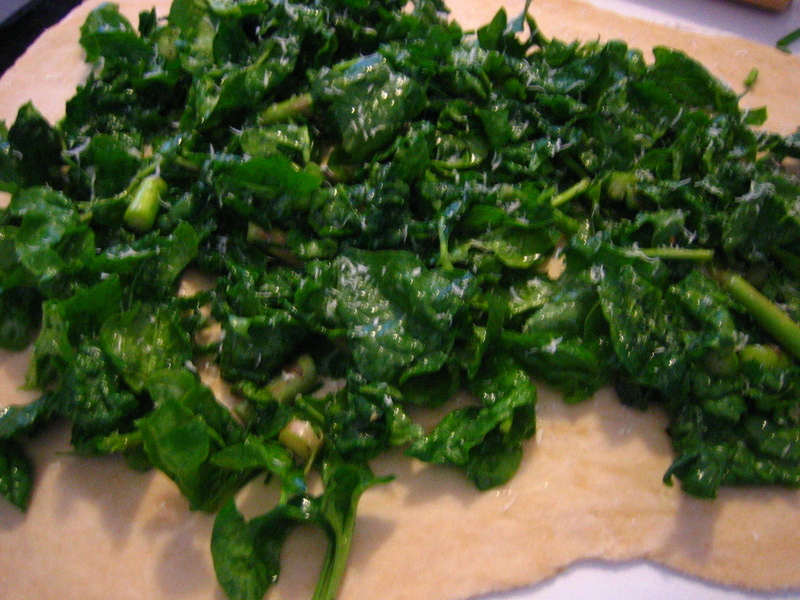 This recipe is roughly based off of a Turkish spinach roll recipe a friend taught me years ago. Since she made me memorize the recipe, and since it’s been six years, I had to somewhat reconstruct it. But it came out wonderfully. Instead of making individual rolls we made one big loaf. I should also say that this is tagged under “fast and easy;” it really is. From getting started to getting this thing in the oven was under half an hour. It does bake for a while though. The dough, smooth and ready to roll. 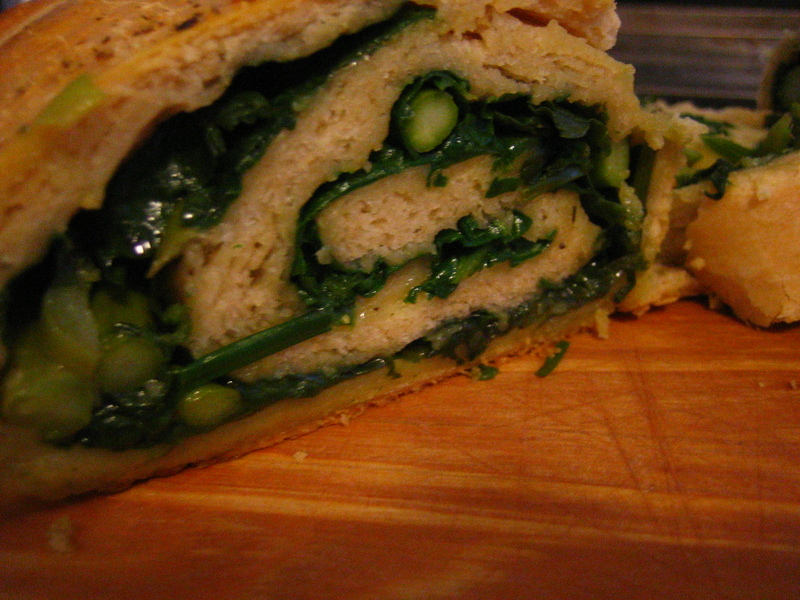 Spinach and asparagus filling spread out over the dough. Finally, the loaf, sliced at a slight angle into spiraled rounds. Add the oil, stir a bit. Add the milk and mix with a spoon until it is too solid for the spoon, then use your hands. 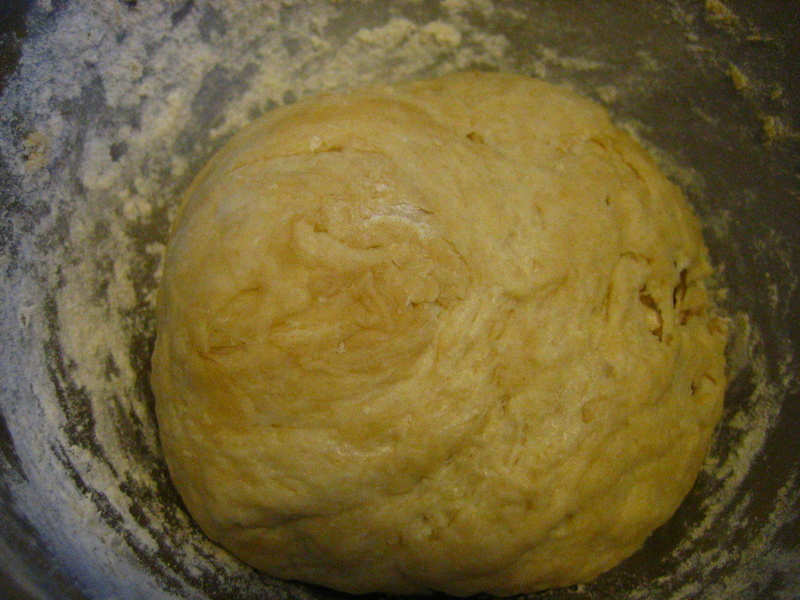 Knead the dough just a little until it is smooth and pliable. At this point make the filling. Do everything on the filling list now. Roll it out until it’s a bit more than a ¼ inch think then spread the filling over most of the dough and roll it from one end towards the other. Use your fingers to press it shut at the ends and bush it with a lightly beaten egg yolk. Last sprinkle coarse salt and ground pepper on top. Finely chop the chives and green garlic. Put the asparagus, chives, and green garlic in a sizeable saucepan with the olive oil and cook on medium low heat for about five minutes. Add some salt, pepper, oregano, and basil. Meanwhile, wash and roughly chop about of spinach. Turn off the heat, mix the spinach in the saucepan and cover, with heat turned off. Add to the dough as explained above. Cut a small handful of chives into 1/4 inch pieces (a pair of scissors works well for this) and place into a small saucepan with a little less than 1/4 cup of olive oil. You should have about 1/3 cup of chives. Then add 1 head of finely chopped cured garlic and cook on low heat for 10 minutes, stirring almost constantly to prevent burning. Roll out the pizza dough and spread the garlic-chive oil over the dough evenly. 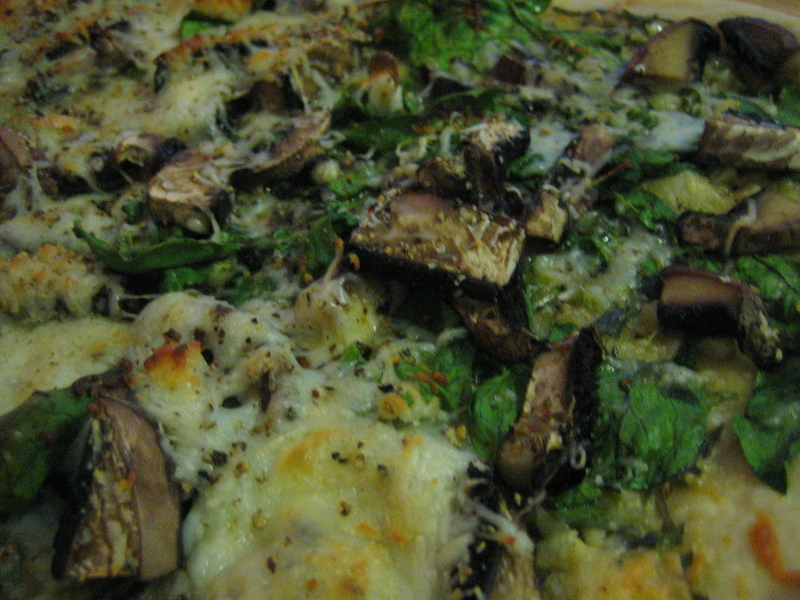 Spread a layer of fresh spinach, 1 finely sliced stalk of green garlic, and 4 portobello mushrooms, cut into 1 inch pieces. Cook at 425 for about 15 minutes. Meanwhile, heat tomato sauce in the same pan the garlic chive oil was in to flavor it. Serve the pizza with tomato dipping sauce on the side.